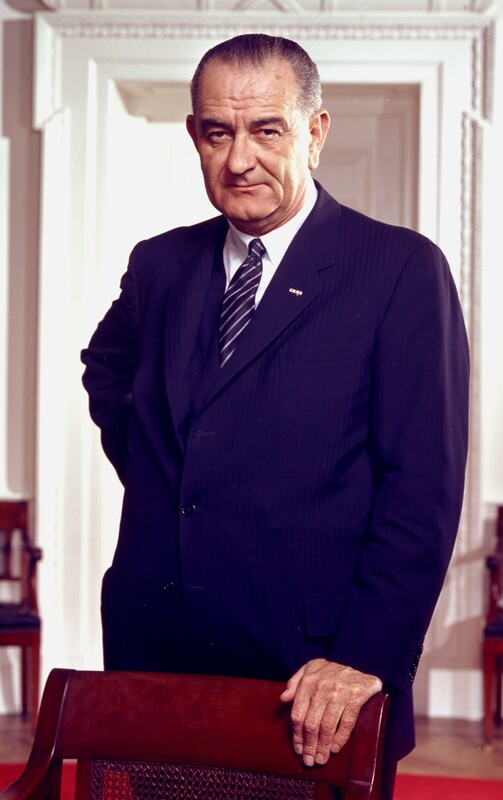 Today in Masonic History Lyndon Baines Johnson passed away in 1973. Lyndon Baines Johnson was an American politician and 36th President of the United States. Johnson was born on August 27th, 1908 in Stonewall, Texas. He was the oldest of 5 children. Johnson was an awkward and talkative child in school. He attended and graduated from Johnson City High School, a town named for his cousin's family, in 1924. He would enroll in the Southwest Texas State Teacher's College (now Texas University) in 1926. He would take 9 months off from school in 1928 and 1929 to help teach Mexican-American children at a segregated school. Both before and after his hiatus from his education, Johnson was active in the campus politics and honed his skills of persuasion while there. He would graduate in 1930. Johnson would run for the United States House of Representatives in 1937 during a special election. He would contest the results of the election successfully and begin serving in the House of Representatives in April of that year. Johnson was a close ally of President Franklin Delano Roosevelt (FDR). The two men worked closely together on several projects involving Texas. Not the least of which was Operation Texas. Operation Texas an undercover operation that brought European Jews to Texas to get away from Nazi persecution. Johnson would serve in the House of Representatives until 1949. In 1940, Johnson was appointed as a lieutenant commander in the United States Naval Reserve. He would report to for duty three days after the attack on Pearl Harbor in 1941. FDR would take advantage of his allies position in the Navy. FDR did not trust the information that was coming up through the normal chain of command in the South Pacific so he arranged for Johnson and two other officers to go there and to bring back accurate information. In 1948, Johnson would run for the United States Senate. This was the second time that he would run, the first being unsuccessful. This time he would be elected to the Senate. He would serve in the senate until 1960. Johnson would further his reputation in the Senate. His reputation grew strong enough that some wanted him to run for President in the 1956 election. For the 1960 election, Johnson delayed seeking the Democratic nomination, he portrayed it as a strategy thinking that a split would form in the party from Kennedy. The delay instead cost him value campaign time. At least one historian stated that it was possibly from a fear of failure that Johnson actually hesitated to get in. At the 1960 Democratic convention, Johnson tried to drum up support. He would go to Tip O'Neil from Kennedy's home state of Massachusetts and ask "Tip, I know you have to support Kennedy at the start, but I'd like to have you with me on the second ballot." O'Neill replied, "Senator, there's not going to be any second ballot." Which there was no second ballot, Kennedy was the Democratic nominee. Although the Kennedy's, both John and Robert, were not fans of Johnson, John F. Kennedy knew that adding him to the ticket would secure the southern Democratic vote, which it did. After Kennedy and Johnson took office, Kennedy decided that he needed to keep Johnson busy and happy. Kennedy stated to an aide once "I can't afford to have my vice president, who knows every reporter in Washington, going around saying we're all screwed up, so we're going to keep him happy." Kennedy appointed Johnson as the head of the President's Committee on Equal Employment Opportunities where Johnson worked with African-Americans and other minorities on Civil Rights issues. In that position, Johnson would end up pushing Kennedy on Civil Rights issues farther and faster than Kennedy was originally planning. On November 22nd, 1963, John F. Kennedy was assassinated in Texas. Johnson would be sworn in just two hours later on Air Force One. During Johnson's Presidency which lasted until 1969, Johnson would domestically focus on Civil Rights issues. In 1965, the Higher Education act would be passed. Johnson chose Texas University as the place to sign the bill in to law. He would return to the school in Welhausen where he taught as a college student. There he would state "I shall never forget the faces of the boys and the girls in that little Welhausen Mexican School, and I remember even yet the pain of realizing and knowing then that college was closed to practically every one of those children because they were too poor. And I think it was then that I made up my mind that this nation could never rest while the door to knowledge remained closed to any American." On the international side, the Vietnam War occupied all of Johnson's administration. At times members of the press sensed that Johnson was being less than honest with his assessments regarding the war in Vietnam. This would be known as the "credibility gap." Despite the issues of Vietnam, on domestic issues Johnson left a legacy of great social reforms and changes, some political and some social. It was the changes in the area of Civil Rights that caused him to loose support in the Southern states though toward the end of his presidency. Johnson would pass away from a massive coronary event on January 22, 1973. Johnson was a member of Johnson City Lodge No. 561 in Johnson City, Texas. Johnson would only receive the Entered Apprentice degree and would not continue on with his masonic work.